“To the wounded, the worn, the wondering. It was such a joy to narrate this collection of beautifully written, poignant stories by Cynthia Ruchti. 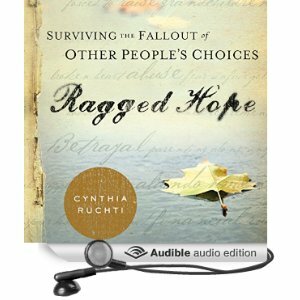 Ragged Hope: Surviving the Fallout of Other People’s Choices follows 25 individuals who share their true story of how they found the strength, courage and resolve to survive the aftermath of other people’s choices. I recorded this book, along with the very talented Alex Hyde-White, and each time I came to one of the stories that I would be reading, I was deeply impacted by how I was also being encouraged, uplifted and moved by the soothing balm that each of these pages contained. Throughout this book, Cynthia Ruchti lovingly illustrates God’s healing power and His ability to meet each of us right where we are – no matter what our circumstance, or how ragged or tattered our hope may be. This entry was posted in Audio Books, Narration, News, Press, Voice and tagged Cynthia Ruchti; Hope; Christian; Christian Audio; Faith; God; Beauty for Ashes. Bookmark the permalink. ← My Theatrical Reel is “Today’s Video” on Actors Access!